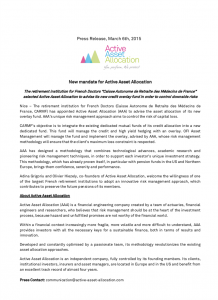 The retirement institution for French Doctors (Caisse Autonome de Retraite des Médecins de France) (CARMF) selected Active Asset Allocation (AAA) to advise the asset allocation of its new overlay fund with its unique risk management approach, which aims to control the risks of capital loss. Adina Grigoriu and Olivier Hiezely, co-founders of Active Asset Allocation, welcome the willingness of one of the largest French retirement institutions to adopt an innovative risk management approach, which contributes to preserve the future pensions of its members. AAA has designed a methodology that combines technological advances, academic research and pioneering risk management techniques, in order to support the unique investment strategy of each investor. This methodology, which has already proved itself, in particular with pension funds in the US and Northern Europe, brings them confidence, serenity and performance. The CARMF wished to integrate its dedicated mutual funds of its current credit allocation into a new dedicated fund, which will manage the credit and high yield hedging with an overlay. OFI Asset Management will manage the fund and implement the overlay, advised by AAA, whose risk management methodology will ensure that the client’s maximum loss constraint is respected.